The two inch by two inch white pine is now available! This design has been in production in the 4"x4" size for over a decade; now it is being made in this smaller size as well. Price is per tile, group photo is shown for reference only. The process photo shows the freshly sculpted tile, before the mold was made. 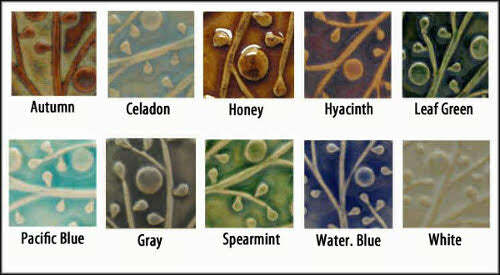 Choice of many glazes, all food safe. Can be hung on the wall- no framing required. Appropriate for permanent installation. Made to order. Raised design is inspired by nature. Original design is reproduced by hand in a durable ceramic material which is fired once to 1800F, then glazed and fired again to 2200F. It is time for artTILE 2017 at indigenous gallery!